Pricing and availability may vary by store. Please visit our FAQ and support pages for details. 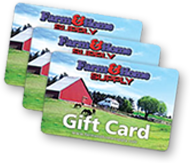 Keep up to date on all things Farm & Home Supply! © 2019 Quincy Farm Supply Co. dba Farm & Home Supply. All Rights Reserved. Our price may be lower than the manufacturer's "minimum advertised price." As a result, we cannot show you the price in catalog or the product page.